Tana Ramsay is a British author, chef, and television personality popularly known for being the wife of Gordon Ramsay, the celebrity chef from the Kitchen Nightmares and Hell’s Kitchen. The amazing couple has been married for over two decades and is often referred to as by the media as the rollercoaster couple. Together, they have four adorable children. It was on August 23rd, 1974 that Tana had her first entrance on planet earth. She was named Cayetana Elizabeth Tana Hutcheson and was born in Croydon, Surrey, United Kingdom. She was raised on a farm and also worked for her father, Chris Hutcheson who was also a business. The identity of her mother till date is a mystery. Also, it is not known if she has other siblings or not. After working for her father, Tana Ramsay decided to pursue a career in the education sector. She went on to acquire training as a Montessori teacher. However, the details of her days as a teacher is currently not available. In recent times, Tana Ramsay has become popular through her stints on various television shows. She has been the host of the UKTV show, Market Kitchen and has also appeared on other popular shows including MasterChef which is being co-hosted by her husband, Gordon. She also participated in the 2010 edition of the ITV show, Dancing on Ice. Unfortunately, she was subsequently eliminated in the fourth round of the competition. One of her daughters, Matilda have taken after her parents and is doing wonders in the kitchen as a chef. She launched her own food show, Maltida and the Ramsay Bunch, which airs on CBBC. Amazingly, her parents have appeared as guests on the show. Additionally, Tana Ramsay is also a published author and has authored several books on cookery. Anyone who sees Gordon on Kitchen Nightmares or Hell’s Kitchen envisages a shouty, foul-mouthed perfectionist who often times barely gets satisfied with other people’s cooking. However, seeing him close to his wife views a perfect young man who can’t raise his voice. Well, Gordon and Tana’s rollercoaster love is something that happened way back. The two met for the first time when Tana Ramsay was just eighteen and was in a relationship with another chef. Because of her relationship, they couldn’t feed their love flame and subsequently, friend zoned each other. On finding out that the lady was single again, Gordon decided to shoot his shot. He played romantically on their first date and swept the young lady off her feet. Their early years in the relationship were filled with mixed feelings. The chef had a tight schedule while working in London and was often incapacitated to see his babe. They worked something out and subsequently, took their forever commitments in 1996 at a church in London. After their union, the couple tried their best to have children but all to no avail. Medical investigations carried out revealed that Gordon Ramsay had low sperm count while his wife suffered from the polycystic ovarian syndrome. While receiving treatments, the couple decided to try in-vitro means of conception. It went successfully as they welcomed their first daughter, Megan in 1998. With more treatments and care, the couple subsequently welcomed a set of twins; Holly and Jack in 1999 and Maltida in 2002. Sometime in 2016, the couple announced on The Late Night Show in May that they were expecting their fifth child, only for a month later, news had it that Tana Ramsay underwent a miscarriage at five months. The family was devasted and leaned on friends for consolation. It almost cost their marriage, however, the couple waxed stronger and maintained the love bond they created two decades ago. Though their unborn son, Rocky never met his family, he is forever in their heart. In fact, his sister Megan participated in the London Marathon race in 2017 in memory of him. See Also: Is Dino MasterChef Gay? Ethnicity, Girlfriend, Where Is He Now? 1. 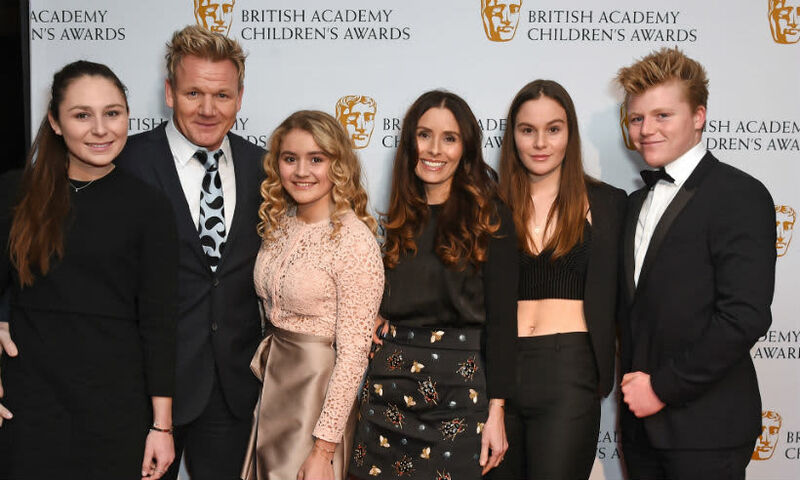 While a lot of people think that the Ramsay children have their parent’s wealth to themselves the bad mouthed chef (Gordon) has publicly stated that his children will receive 25% for a down payment on a home. 2. He also stated that he is not in to spoil his kids and has decided to keep it real with them so that if life gives them lemons, they would be able to make lemonades out of it. 3. Tana Ramsay is quite active on social media. She has in every way supported the dream of her husband and children and has also had plenty of family time with them. 4. The couple announced that they were expecting another baby in March 2019.